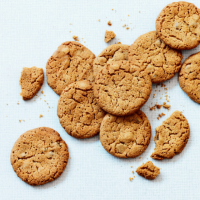 These biscuits have a chewy middle, a crunchy outside and a really spicy kick. For a quick pudding, serve with a scoop of softened vanilla ice cream. 1. Preheat the oven to 170°C, gas mark 3. Line two large baking sheets with baking parchment. 2. Chop the stem ginger into very small dice and set aside. Place the brown sugar and butter in a large mixing bowl and, using an electric handheld mixer, beat together until creamy. 3. Sieve the flour, bicarbonate of soda, mixed spice, cinnamon and ground ginger into the bowl. Stir in the stem ginger and syrup, until everything comes together to form a dough. Tip onto a work surface and gently knead until smooth. 4. Break up the dough into 24 even-sized pieces and roll into balls. Place 6 on each of the prepared baking sheets, spaced well apart. Flatten each ball a little, then bake for 15 minutes until golden. They will still feel a little soft but will firm up as they cool. Repeat with the remaining dough until you have used up all the mixture. Cook’s tipThe uncooked dough freezes well. Roll into balls, flatten slightly and freeze layered up between baking parchment. To bake, take out the number you want and bake from frozen for 3-4 minutes longer.